The third in the DI Tom Thorne series of novels that over the past decade or so has established comedian turned crime writer Mark Billingham as one of the biggest names on the British crime writing scene. Following on from the excellent debut SLEEPYHEAD and the follow-up SCAREDY CAT, LAZY BONES sees Thorne and his colleagues once again delving into the darkness. Overall, I found LAZY BONES to be explosive, gritty, well-plotted, and full of fascinating and realistic dialogue and absorbing characters. It is an excellent read from a crime writer that was already really hitting his stride at that early point in his career. From the writing alone (leaving aside plot etc), within a few pages you can tell you are in 'safe hands', that you will be taken on terrific ride. There's punch to the prose, energy and life. 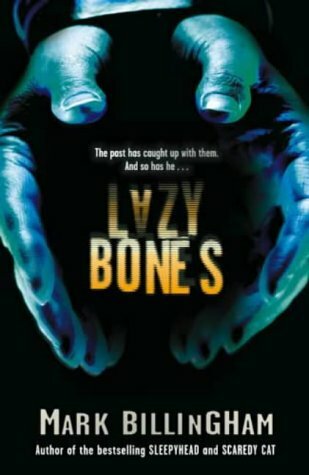 In LAZY BONES, Thorne and his London-based serious crimes unit must track down a serial killer who is targeting and brutally killing rapists. Of course, this scenario immediately raises issues of whether the approach to and view on the case by the media, members of the police, and the broader public (or at least, the most vocal parts of the public) changes when the victims are seen to be less 'pure and innocent'. After all, it would, of course, be easy for some (many) to think the victims were merely perpetrators finally getting the punishment the justice system was too lenient and forgiving to mete out itself. Just desserts. When the forensics team can't find "the life sentence hidden in a dustball" (ie DNA evidence that could lead to a killer's conviction), Thorne must follow up a mountain of less-than-promising leads while generating a sea of new ones in an investigative cycle that starts afresh with each body found bound, gagged, mutilated, and violated. Already beset by slow-witted bosses, minuscule resources, and a tabloid press rooting for the killer, the detectives are further hobbled by problems in their own personal relationships. A particular aspect I enjoyed was that the book takes a look at how the killer came to be, not just who they are, delving into the ongoing effects of childhood trauma. How a psyche can be twisted based on the things that can happen to us. How we can seek to justify our actions, no matter how horrendous. LAZY BONES is more than just a breezy 'airport thriller'; there is plenty of depth beneath the quick pace and great tension. Another of the many good points about LAZY BONES is that the investigators are notably rounded, human, and fallible. They are not supercops, or forensic investigators that can do no wrong (without a hair falling out of place). They question themselves, and the passion they have for their jobs. Issues are raised in readers' minds, while we are hurtled along a dark, twisting, exciting journey. Fairness and justice. Revenge and retribution. Billingham dials up both the action and the thought-provoking themes, harnessing his considerable talents into a terrific example of the darker, grittier part of contemporary crime fiction. If you haven't yet discovered Mark Billingham... pick one of his novels up and read it today - see why he has attained a seat amongst the upper echelon of contemporary British crime writers. I originally read this book several years ago, and have previously written a short online review. This review is an expanded look at the book, as I endeavour to share more of my thoughts on the many good, great, and otherwise crime novels I have read (and usually enjoyed) in recent years. Have you read LAZY BONES, or any other books in Billingham's Tom Thorne series? Would be interested to know what you think of the series, and his writing. Comments appreciated.